102 year old Senata Marata (left) with her couson sister,Litiana Korodrau at her home in Nakasi Hart yesterday. The key to her long life is having a life free of worries, says centenarian Senata Marata. She added serving God everyday and trusting in Him was the cornerstone of her long life. Ms Marata turned 102 years last Friday. She has been a widow since her husband, Leone Kavida, died in 1986 and has been living alone ever since at her Nakasi HART home in Nasinu. “My advice to people is not to worry a lot. Whatever you want the Lord will give and this is what has brought me this far,” Ms Marata said. 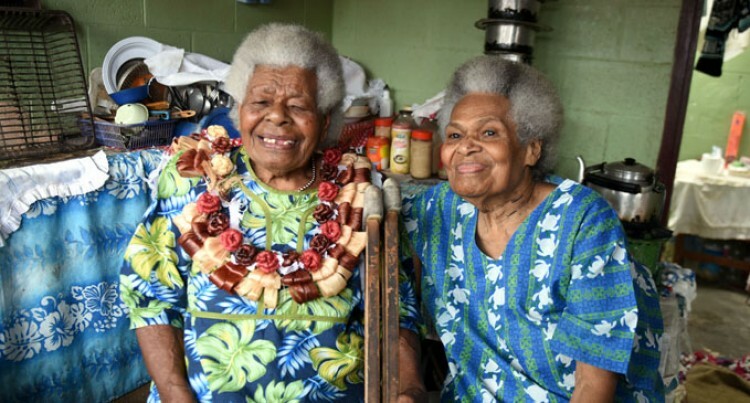 Being the eldest of eight children, Mrs Marata was born in her village at Nasaibitu in Wainibuka where she and her cousin Litiana Korodrau, 80, are the only ones of their generation still alive today. Despite her age, she still washes her own clothes, cooks her own food and goes for her monthly shopping when she receives her Social Welfare voucher. She said she was fortunate to have lived past a century and was still enjoying life.